When it comes to using ethanol blended fuel in your boat engine it is important to follow manufacturer directions and actually just properly maintain your equipment. That is advice from pro fishermen like Terry Richard here. 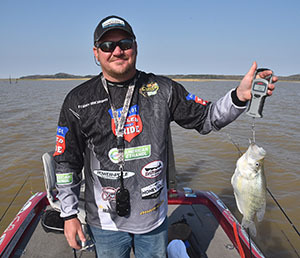 Terry and teammate Casey Rayner will be competing in this weekend’s Crappie Masters tournament sponsored by The Renewable Fuels Association, American Ethanol, and Bass Pro Shops. It’s the Grenada Lake National Qualifier Mississippi State Championship. Terry and Casey are sponsored by the Renewable Fuels Association. In the picture you can see Terry with a 3+ pound crappie he caught on pre-fishing day here on Grenada Lake. That’s his first three pound crappie! You’ve got to believe he’s excited for competition to start. I’ll have more information from this event as I talk with teams like this one about their use and experience with E10 gas in their boat engines.